...just that. Comments welcome -- on content, mechanics, style...whatever..
Monday is here! Well I had a moderately long list of things to do today, most of which I didn't get done. I did however finally finish The First Circle by Solzhenitsyn. So it was a day off my mark, but nonetheless, I am quite pleased. I've been struggling through it for several months now! It is indeed a long work, but it is by no means boring or difficult to read. But we all know how it can be after working long days, reading a thought-dense book can sometimes become slow or even be put off. When I read, I want to really read, to be active, to think, not just to skim a story, and so for some weeks this 500 or so page volume has gathered dust beside my bed, being read little by little. Ah these Russians! The way they work the old and new philosophers into the words, thoughts and actions of their characters -- so subtle, so deliberate, so masterfully. The gift is in the embodiment of a philosophy within the character it seems to me. Before you know it you are seeing an application of thought which perhaps before you only knew theoretically. And again you find yourself sympathetic towards a character whose philosophy of life is absolutely contrary to what you know to be true. Here you are convinced of the innate goodness in man, there you feel intensely that man is at heart a selfish creature. And just when you think you might have it all sorted out, can recognize each prisoner by his three or four names, can match tones and skills to each, can perhaps even guess what will come next for each, how their characters will play out, the circle closes and you are shoved unceremoniously out into the snow again and reminded that this "novel" is not quaint and is not fanciful, but a brief glimpse into a reality not that far off. Oi! I'm sort of dying to go through it again with The Inferno by my side to do comparisons, but that shall have to come some other time... for now I have to continue my quest for 35 books. Next up: Poe Short Stories. Supposed to have finished yesterday, but only about halfway; perhaps this evening. Seeing as it as Monday, however, I remembered that I haven't posted any music here in quite a while. The other day Brandi Carlile came out with a fantastic new album called Bear Creek. The entire album is really quite wonderful -- introspective, melodic, harmonic. Certainly as good if not better than her previous albums which, frankly, at this point, were they on tape I would have worn out by now. There is something so honest and human in her lyrics, it's difficult not to like even if you are not a fan of the folk genre. It also helps that she has one of the most incredible, controlled yet malleable voices I have ever heard. Yeah, I'm a little bit of a fan ;) Here is a little taste of one of the more known tracks off the new album; enjoy! Well Summer is finally here! Despite all the rain this last week, I am nevertheless quite happy with the thought of coming afternoons filled with sunshine and perhaps some swimming. I find it very difficult to write anything during the school year; teaching can be so draining -- physically and mentally. Next year I will have to find a way to continue reading, writing and drawing even during the sometimes tedious weeks of the school year. 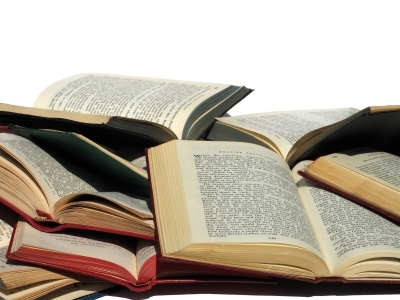 Last summer I had a goal of reading 35 books, both thick and thin, light and serious. I got to 19 before September rolled around, I think. Let's see, what did I read? Tintin (got it as a surprise gift from my Principal), The Great Gatsby (been meaning to really read this classic, beyond skimming it for my Comp Exam), The Prophet (many thanks to William Michaelian), Mere Christianity and A Grief Observed by CS Lewis (Lewis is so incredible, I need to reread The Silent Planet trilogy again), Literary Converts and The Unmasking of Oscar Wilde (by Joseph Pearce, so grand! Can't wait to read his bios of Belloc, Solzhenitsyn, and Shakespeare; he blows me away!) Huh, well, I can't remember any others, and I'm too lazy to turn on the light to look at my bookshelf. More on those later, perhaps? Ha. Well, this summer I have a plan to read 35 books as well. Hopefully I can do better than last time? I've finished Lord Jim and am in the middle of The First Circle. Up next I need to finish Essays by Tate and Essays by Milosz, then finish the collected works of Yeats, and finally get through Hirsch's How to Read a Poem. But first I have to find Poe's Short Stories and finish that. I start a lot of books during the school year if you couldn't tell! It's the finishing I have trouble with! It can be so difficult just to sit down and read sometimes! It's not that I do pointless surfing when I'm on my computer -- I read over 100 blog posts a day and follow every post of various design sites -- but it can never feel as comprehensive as reading an entire book. I suppose the remedy would be to set a reading schedule, but I think we can establish the fact that I am not very good with schedules. 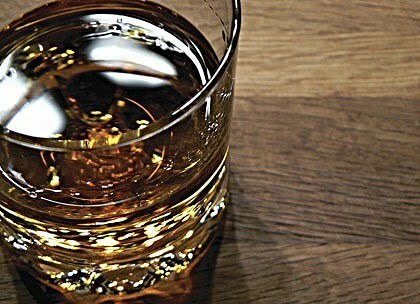 Ah well! I should be able to get through Solzhenitsyn and Poe by Monday methinks. To everything turn, turn, turn, there is a season, turn, turn turn... I would do well to remember this. I found this little gem a day or so ago (see video below). M. Chapon says of his work "During 3 years (2008-2011) i have been drawing 12 drawing of animation every day, it make one second of film. I had no plans what so ever before starting the first drawing. And then, each of the following days, I took the 3 last drawing from the day before and kept on animating. I use a none erasable pen, and drew on the back side of used A4 paper." 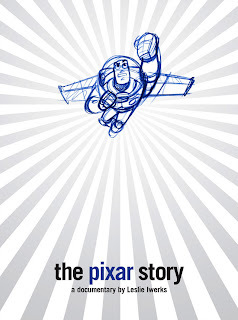 Also the other day I watched The Pixar Story, a documentary about Disney/Pixar. You know, the guys who brought us Toy Story, Monster's Inc., A Bug's Life, and The Incredibles. I kept seeing the title for it on Netflix and elsewhere but for some reason I hadn't watched it yet. I do this thing where I put off watching something even though I really want to see it -- it's super weird, I know. I think maybe I am avoiding being disappointed, maybe? That is all I can come up with anyhow! Well it turns out it was really great! The documentary gives on a good insight into the Disney world and the challenges that computer animators face, while at the same time putting faces and characters into the works that we have come to know and love through this working relationship of the Disney and Pixar studios. I think that people forget that Disney was first and foremost an illustrator and a story teller. 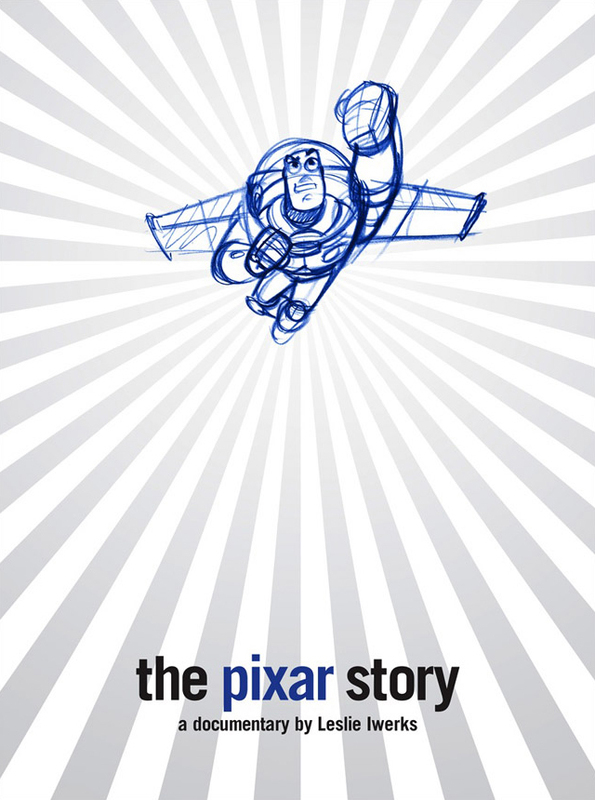 This film delves into the modern problem of bringing cool animation and the story together, while continuing the Disney, and now Pixar, tradition, as well as what it takes to finance, via a young Steve Jobs, such a new and expensive company. When I was a young kid, around 13 or 14, a good friend of our family gave us our first computer. I immediately became fascinated and started doing designs for my mom's embroidery business. These designs were nothing incredibly difficult or complicated, mostly lettering and simple logos, all by trial and error. I liked it though, and the rigorous problem solving it presented. I remember in the those first days he showed me a program that was, I realize now, a very clunky illustrator. In fact, I think it was one of these programs in which you can't really do anything, but which merely showcases an up and coming technology. He told me that if I were interested in such things, I should let him know and he could give me more information and help about it. My mind took flight that day, imaging the things I could draw and animate with such a thing. Shortly thereafter this friend moved with his family and we lost touch. The computer was something I worked on by myself, learning as I went, like many other things I loved as a child, teaching myself. This is the way it always seemed to go, and even now it is hard to find like minded people even among my most intimate friends. It's not something I feel bad about, for the most part, but it does make me wonder sometimes what I would have been. We all can wonder about what we would have been, if we had taken a different path, I suppose, a symptom of human regret. Every once in a while I come across something like this documentary and it stirs up those feelings of fascination and excitement that I experienced when first I saw it as a child. I like that. It's like Proust's madeleines, and it makes me feel. Hello all. Hello me. 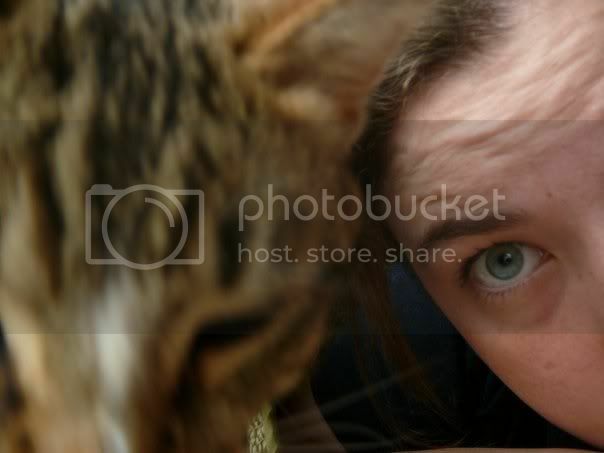 Hello blog :) (Wow, this is a seriously ugly and boring background, what was I thinking?) It has been a while. Graduating from university can throw a person into quite a tailspin. A good year and a half now has passed, and I've been busy getting older and trying to make my way. A little reading, a little painting, a little crying, a little working (read: mostly working) and not much writing. More about that later, perhaps? Never fear, I have faithfully been reading away each night, keeping up on my blog reading queue, and have even gotten a few honest to goodness books read in the meantime. I sometimes get discouraged when reading about famous people and all the books that they read and that influenced them. Sometimes half the books that they list as being most influential I have never even heard of, and I think to myself how could I ever be at their level? But I also take courage in the fact that I have read loads of "modern" books that they will never read. We can't read all the books in the world, but we can try can't we? Well, as long as we keep reading that is what counts -- until that day in the nuclear waste land when we crush our only pair of reading glasses. 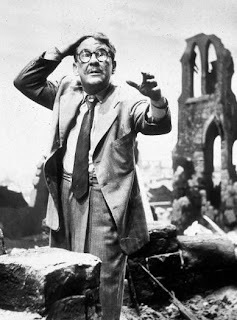 Yes, I am a nerd and that episode of Twilight Zone haunts me! 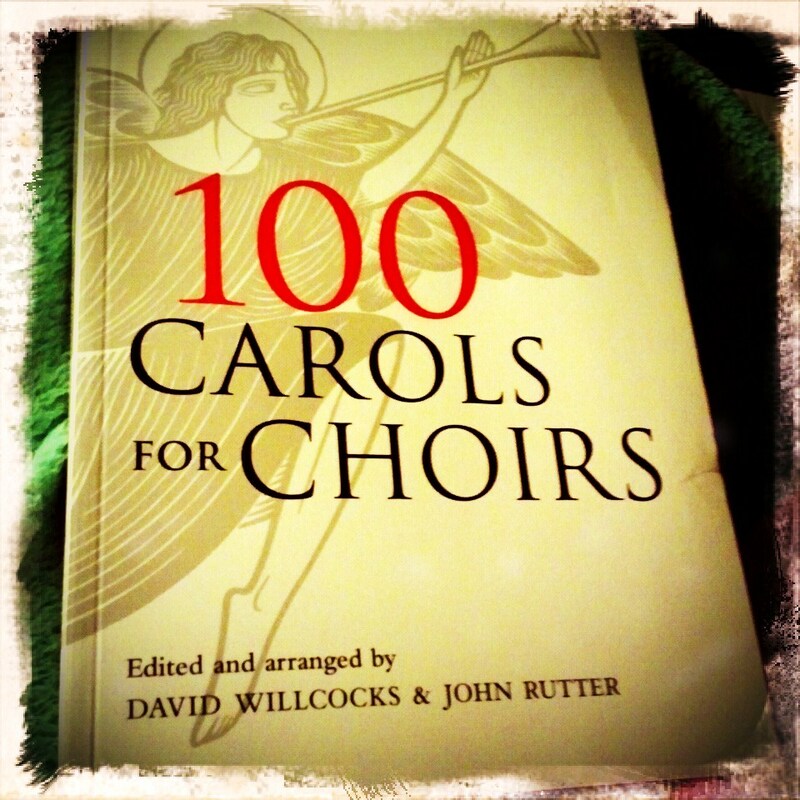 FINALLY bought this 100 Carols for Choirs. 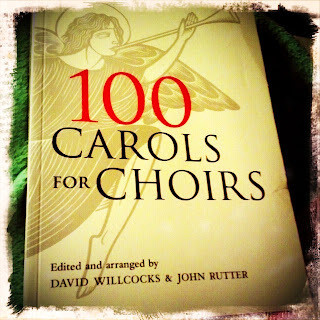 It's by David Willcocks and John Rutter (whom I adore) and chock full of favorite Christmas music, mostly SATB with piano accompaniment. Katie's Grandmother had it when I lived in upstate New York a few years ago and I've been dying for it ever since. My sisters were a little less excited than I since they think they can't read music, but they will come around I'm sure. In fact the other day they were calling me in to sing some alto on Once in Royal David's City. The songs they know they will pick up and sing, not realizing they are doing a fair amount of note reading, but if they haven't seen it before it is too much. Little kids just learning to read do this too -- whenever I'm in the library there are always a few students who won't attempt a book because the words are too small and numerous. Sometimes I find the same book for them with bigger print and more pictures and they are convinced to read it. Oh well, they'll get there too :) Speaking of carols, I'm supposed to go do that in 15 minutes, so I ought to get bundled up. Will finish gushing at a later date. "I don’t think people are used to seeing and thinking about rivers this way — realizing their interconnectedness, their importance in the establishment of settlements, or the fact that they were humanity’s original transit networks. It’s not something I’m ignorant of, but I don’t think about rivers like this regularly. I’ve lived in cities that are on rivers without ever noticing. Rivers are to me are often just those thin blue lines lost in the background of a lot of reference maps..."
I, residing in the chair of comfortitude and having dominion over this blessed realm, henceforth declare this day and all of the following unto eternity or until that time at which this day shall cease in its existence forthwith to be dubbed and celebrated as Malt Monday. If there be any herein who shall deny this day in its golden malted glory, let him reflect on the words of Housman, a learned doctor of this realm who boldly said "... malt does more than Milton can to justify God's ways to man..." If such there be who shall desecrate said golden malted glory and its appointed day, let him be anathema. "And years from now when this old light Isn't ambling anymore Will I bring myself to write?..." As Mark said, is it possible to be funny and annoying at the same time? Yes. Yes, it is. I'm dying laughing. Don't ask me why. Mission Impossible. Hilarious. The Good, The Bad and The Ugly. So pathetic it is but gusting. p.s. I love spoonerisms! ha! Copyright © Cassandra LaMothe 2007-2013. Watermark theme. Theme images by sndr. Powered by Blogger.